The 2018 Planet Forward Summit is a two-day national conference on sustainability storytelling. A diverse group of students, scientists, communicators, innovators, private sector leaders, and policymakers will share inspiring stories of our planet, and learn techniques of effective communication and compelling storytelling. On Day 2, we will celebrate and reward the best environmental storytelling told by college students by awarding the prestigious Planet Forward Storyfest Awards in front of a live audience. Storyfest 2018 grand prize winners will travel on a weeklong storytelling expedition with eco-tourism pioneers Lindblad Expeditions in June 2018. Led by storytelling platform PlanetForward.org at The George Washington University School of Media and Public Affairs, the Summit includes major speakers and topics covering challenges and solutions related to food, water, energy, mobility, built environment, biodiversity, and more. Head to your app store and look for Convene by Thomson Reuters. breakout session information and more! Storytelling for a changing planet – Frank Sesno tells us why we need stories now…more than ever. Through powerful photography and story, Dennis and Jim reveal the Anthropocene – a new geological age where human activity is the dominant influence on the environment. We learn about “Eyes on Earth” a platform created to inspire a new generation of photo journalists. These students found their voice with Planet Forward – sharing stories from their hometowns, to the far ends of the world. BETH STEWART, Creative Director Discovery, Inc.
From a farmer to a media executive, from a CEO to a chemical engineer; leaders come in many forms. We wanted to ask, “What’s Your Sustainability Story?” and what drives you to move the planet forward. Learn how The New York Times approaches their climate and environmental reporting. What are some of the new ways to visualize data and how can it engage wider audiences? Anything is possible with virtual reality – but can it emotionally connect people and our planet in new ways? Through 360-degree video, go inside an Icelandic glacier and learn how this storytelling can create a sense of place. Eyes on Earth Workshop: Dennis Dimick, who served for many years as National Geographic's environment editor, and National Geographic photographer Jim Richardson founded Eyes on Earth to ignite interest with visually compelling, scientifically based environmental photography. They will share with students lessons learned from their decades of experience creating powerful environmental storytelling — and challenge them to make a difference in our world with their photography. The Power of Diversity in Moving the Planet Forward: To move the planet forward we need to improve efforts and public policies around diversity and inclusion, in particular in fields related to the hard sciences. How can we create systems, organizations and leadership opportunities that encourage more women and ethnic minorities to enter science-based fields, find their voice, or go into leadership positions? This panel will feature three champions of diversity and inclusion. Escaping Your Bubble Without Losing Your Bearings: Preparing to Talk about Climate Change: We now live in social/media bubbles of our own choosing. As a result, we can be surprised, even stunned, when we try to talk about planetary issues like climate change with people outside our sphere. In this session, you will learn about the arguments most frequently offered for dismissing climate change, and you will learn some common-sense, storytelling techniques for countering them. These techniques may not enable you to persuade hardened cynics, but they may help you keep others, including yourself, from being persuaded by them. Sharing Science with Anyone and Everyone: Being able to tell a good story is a must in successful communication, scientific or otherwise. However, before you even think about what story to tell, you need to understand who you’re telling that story to. In this interactive presentation, participants will learn how to identify and connect with their audience, craft an effective message, and practice via roleplay with their peers. Fundamentally, a good story is: a compelling character overcoming obstacles to achieve a worthy outcome. In environmental storytelling, there can be extra layers of complexity and data. How do we build stories to develop characters, embrace uncertainty, and appropriately include numbers and data? Meet three journalists who can guide your approach in this space. Farming, Technology, and Environmental Stewardship: How does a water conservation-minded production ag farmer and a public school educator keep nearly 10,000 acres of crops watered — and still be able to sleep at night? Hear Paulman Farms owners Roric and Deb Paulman talk about the technology they use to efficiently manage their land and the natural resources available to them, while also preserving the aquifer. What is Adobe Spark? What kinds of new software can help us tell visual stories in new ways? Adobe Spark is a set of three separate tools that makes it easy to create social posts and graphics -- including web stories combining text and graphics. Discover user-friendly ways to create animated videos that can be customized with themes, images, icons and text. Stephen Hart from Adobe will reveal how to tell your story without having to learn sophisticated tools. In 2015, 193 nations agreed to a set goals and targets that address a broad range of issues related to global social and economic development. How can we tell the story of these 17 important goals in a way that ignites and maintains public interest and support? How can storytelling be a mechanism for implementing the 2030 agenda? In this breakout session, communications expert Claudia Koerbler discusses the challenge (and the opportunity) with UN-FAO’s Vimlendra Sharan and IFC’s Unnatti Jain. When Anand Varma takes a photograph of a parasitic wasp consuming a caterpillar from the inside, he doesn’t want you to be disgusted. He wants you to be astonished. Go on a journey with Anand and learn about the National Geographic Society’s Early Career Grant. Do We Have the Energy to Lead? This unique Planet Forward Town Hall will explore whether America can still lead on climate change and renewable energy. Along with our audience, remarkable leaders in energy, environment and conservation, will consider the story of America’s energy future. Six grand prize Planet Forward Storyfest winners will be announced! Winners will travel with Lindblad Expeditions aboard the National Geographic Sea Lion on an 8-day voyage between Sitka and Juneau, Alaska. The 2018 Planet Forward Summit will take place at The George Washington University and begin Thursday in the Jack Morton Auditorium, move across the street to the Marvin Center for lunch and breakouts. Friday the event will return to Jack Morton Auditorium for a Town Hall and our 2018 Storyfest Awards presentation. Updated lodging info coming soon! Planet Forward has held a block of rooms at The University Inn (soon to be The Arc Hotel) at a special discounted rate, which will be honored until March 14, after which the rooms will be released to the general public. For alternative lodging options, please contact Hannah Dale, Planet Forward Program Coordinator, at hannah@planetforward.org. guiding guests to different locations, as well as other general tasks. Planet Forward, a project of the Center for Innovative Media at The George Washington University School of Media and Public Affairs, teaches, celebrates, and rewards environmental storytelling by college students. 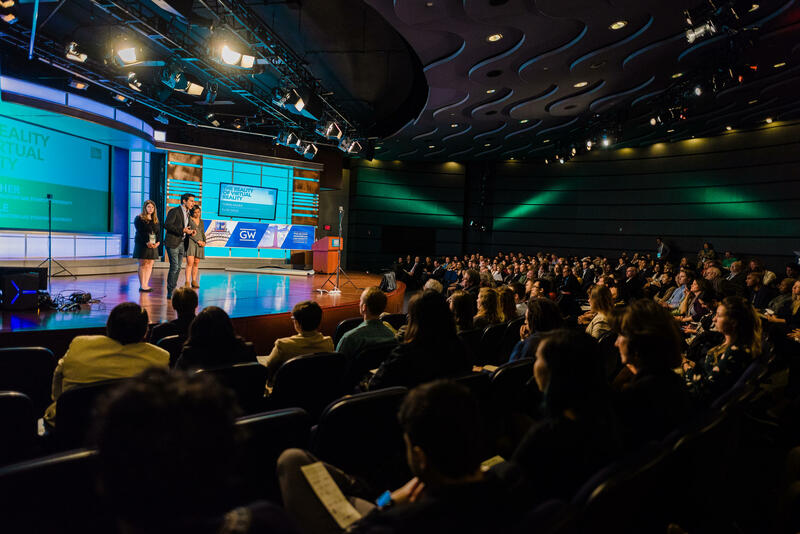 Engaging a diverse audience of college students from across the country, Planet Forward uses storytelling, media, and educational events to tell the stories of invention and innovation that can move the planet forward.